There are many Dinsdales and Wilkinsons in the Fewston registers. Neither Thomas’s nor Rachel’s baptism has been found there. THOMAS DINSDALE. Thomas’s age at his death gives him a birth date of 1766-7. There is a possible baptism in Hawes, some 30 miles away. There were a large number of Dinsdales in the Hawes region, but it seems more likely that Thomas came from nearer Fewston, though we have not found his baptism. Rachel, daughter of Thomas Wilkinson, baptised on 9 June 1773 at Knaresborough parish church. Knaresborough is 10 miles from Fewston, just NE of Harrogate. There is no evidence of this Rachel dying before the date of Thomas Dinsdale’s marriage to Rachel Wilkinson or of her marrying anyone else. But since Thomas’s baptism has not been found, Rachel’s may be on the same missing page or missing register. She moved to Fewston before her marriage. She is the only Wilkinson in the registers around that time. Thomas Dinsdale and Rachel Wilkinson, both of this parish, were married by banns on 4 Nov 1793 at Fewston parish church. Both made their mark. Rachel would have been 20 and Thomas 26. They had nine children baptised at Fewston. West End now lies submerged beneath Thruscross Reservoir. It has been replaced by a modern hamlet of that name close by. There are many burials for the children of other Dinsdales, particularly James and Joseph. Thomas’s family seem to have survived. Despite his status as labourer, the family were probably not amongst the poorest. There are marriages in Fewston for Ellen Dinsdale in 1821, 1825 and 1826. In the first one Ellen makes her mark. One of the witnesses is Elizabeth Dinsdale. Thomas Dinsdale of West End died in 1828 at the age of 61. He was buried in Fewston on 31 May. Later that year, the eldest son John married Christiana Hadwin in Fewston in October 1828. Their second daughter remained unmarried. Mary daughter of Thos Dinsdale was buried on 13 Sep 1831 aged 35. Her address is given as Thornthwaite late West End. Thornthwaite is another hamlet a mile to the east. Two months later there is a burial for Elizabeth Dinsdale of West End on 30 Nov. There is a probable marriage for Thomas junior to Mary Ann Stoney at Fewston on 9 Jan 1837. Both groom and bride make their mark. In the 1841 census Thomas is a cotton weaver. In the 1841 census Rachel is living at Hobson City, Fewston, Pateley Bridge, with four of her adult children. Hobson City was a handful of cottages within the township of Thruscross. 1841 Census. Hobson City, Fewston, Pateley Bridge. All are born in Yorkshire. 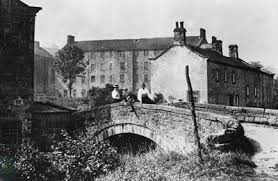 Thruscross was known for its flax mills, but the Dinsdales are employed weaving cotton. We would normally expect a young unmarried woman like Eden to be working in the mill. Rachel may no longer have been able to manage household duties on her own. She died a few months later. Burial 15 Oct 1841 Rachel Dinsdale West End aged 70. In 1845 the youngest son Joseph Dinsdale of West End married Elizabeth Shepherd, also of West End. His occupation is hard to read, but it may be piecer. Matthew died in 1867 at the age of 61. Genealogical information and censuses from Findmypast.